The HP-35 was HP's first pocket calculator. 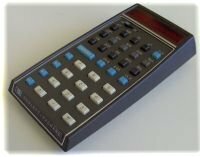 It was introduced in 1972 when most calculators (including expensive desktop models) had only the four basic functions.The HP-35 was the first pocket calculator with transcendental functions and the first with RPN, Reverse Polish notation. During the production process, the revolutionary HP-35 was slightly modified developing to four distinct versions. The first HP-35 (version 1) was the earliest and only production version that reveals a red dot to the right of the power switch when turned on. Another Red Dot characteristic is the serial number label placed between the 2 lower pads on the back of the calculator. The serial number should be typed into a narrow silver region. At these pages you can find almost all Red DOTs known today.